Seventh Avenue Apothecary was created to pay homage to Ybor City where Pesano’s family lived and to her family’s heritage. “The candles were born out of a brainstorming idea and the way we chose the scents were by the things the girl’s grandparents loved,” Pesano said. “Our signature scents are reminiscent of the historical, cultural and culinary legacy of Ybor City and our own Cuban and Italian heritage.” Their distinct fragrances are blended using an all-natural soy wax, free of dyes, with natural coated cotton wicks. Every candle is handcrafted at their shop in Ybor City. Some of their signature scents include tobacco leaf and vanilla bourbon, kumquat and clove, and lavender and black pepper to name a few. They also have created a limited edition candle for the Gasparilla season, which comes in a glass jar with skull and crossbones on it and a strawberry-mango candle in honor of the upcoming Strawberry Festival in Plant City. In addition to keeping family heritages alive and well, Pesano and her family strongly believe in keeping things local and giving back to the community. “Keeping things local is very important to us,” said Erin Grossman, “Our goal is to boost the local economy and we do that by having our candles available in local retailers.” The ladies love to cross-promote their candles on their website and social media pages by listing all the retailers in the area that sell their candles. They also donate their candles as auction items to various community organizations such as the Brandon Foundation where Pesano’s husband, Charles, is a board member. He is also the Executive Director of the Florida State Fairgrounds. “We love supporting the Brandon community because we live in the Brandon/Valrico area,” Pesano said. 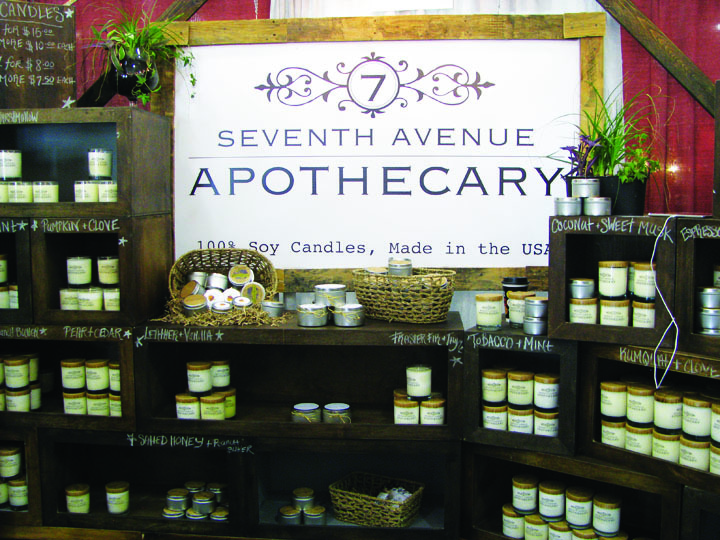 To learn more about the different candles offered at Seventh Avenue Apothecary, visit them on the web at www.tampasoy.com or contact Pesano at 247-3814. Their Website also lists the various retailers in the Tampa Bay area where candles can be bought. Stop by their showroom located at 3814 E. 7th Ave. in Ybor City to see how their candles are made.